"I can't believe you guys. Do you get up in the morning, call each other up, 'Good morning, Marcus.' 'Good morning, Mike.' 'How you doin'?' 'A'ight.' 'So how we going to f***-up the captain's life today?' 'Gee, I don't know.' 'I don't know.' 'Ooh, look. Over there. Let's kill three fat people and leave them on the street'?" Bad Boys II is sort of the ultimate summer movie, fast-paced, offering explosive action and a script that makes little to no logical sense and yet it is as fun as any film that has come out in quite some time. Returning to the story and characters that were originally introduced in his 1995 debut film, Bad Boys, director Michael Bay has delivered what may be his best film yet, despite the possibility that the film may have been better had Bay not been the director. This may be because Bay acts more as a helpful guide for stars Martin Lawrence and Will Smith to share their terrific chemistry more than as a story teller, largely because the story offered is shabby and full of holes. In this go round, Detectives Burnett (Lawrence) and Lowery (Smith) are part of T.N.T. (Tactical Narcotics Team) and their target is the supplier of a new designer Ecstasy-type drug that is currently taking over South Florida. The importer is Johnny Tapia (Molla), a seemingly untouchable drug lord who is using empty cadavers to smuggle drugs past customs. As if this weren't enough, the duo also has to protect Burnett's sister, Syd (Union), as she works on her own case for the DEA against Tapia. In many ways, Bad Boys II is the epitome of an over-the-top action picture, including a freeway chase that likely sets the record for the most property damage in a filmed car chase, but the level of energy that radiates is impressive. It is impossible not to get swept up in the slick visual style of Bay, and, with the help of producer Jerry Bruckheimer, the explosions and gunfights come at a rapid rate.Thankfully, the pair have reworked the same formula that made the original film successful and carried it over to the sequel; in many ways, even the sequence of events is the same in both film. By using very little CGI as well as some truly inventive camera angles, Bay has, at the very least, one or two scenes in this film that demand admiration. The first and most impressive is a 360-degree camera rotation during a gun fight in a rundown drug house. Bay effectively ratchets up the tension by constantly moving the camera in a circle in one smooth motion as we see each side involved in the shootout. The other is the aforementioned freeway chase that is unlike anything ever done on film as cars fly off of a carrier at high speeds, playing Demolition Derby with those in pursuit—it is an inventive chase and Bay's direction makes it work. What makes Bad Boys II a better effort that the original film does not stop with Bay's direction or the much larger scale of the film, but also the script written by Jerry Stahl and Ron Shelton. Together, the pair have written a script that is overloaded with elaborate action sequences but also manages to includes some truly funny moments throughout. They are helped by the chemistry of Smith and Lawrence, who have several scenes together away from the action that work well solely because of their dynamic—look to the sequence in which Burnett mistakenly ingests Ecstasy, and one with a prospective date for Burnett's daughter for the best examples of this. Image Transfer Review: The original release of Bad Boys II boasted an absolutely amazing 2.35:1 anamorphic widescreen transfer. By all indications this Superbit release should look better right? Well the answer is just kind of, which with the Superbit trademark present is not something we want to see. Where this one excels is the sharpness and detail are light years beyond the quality found in the previous version providing the transfer with an even better film-like look, making this one of the more 3-dimensional transfers I have seen in some time. Colors also come off looking slightly better here, as the lush browns and oranges of the Miami location are positively stunning here. There is little to no edge enhancement or flaws in the print, so this is a very impressive transfer. Audio Transfer Review: The DTS and Dolby Digital 5.1 mixes are each better here than in the original release and they seem to add more definition to the soundfield, making this one of the best DTS tracks on the market. As with any big-budget summer blockbuster, the sound here is as in your face as the movie, directionality in the surround speakers is amazing as gunshots whizz past on several occasions and, especially in the freeway chase, ambient sounds are all over the room. Dialogue is clear throughout with nice depth, while the .1 LFE track offers some truly impressive depths throughout the course of the film. Extras Review: This is Superbit boys and girls, no extras here. 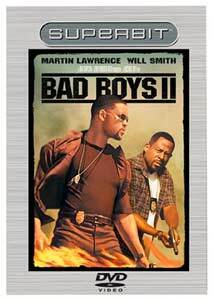 Bad Boys II was originally released in a extensive two-disc special edition in December 2003, and the second disc was loaded with extra features. The release of a Superbit title does not make the most sense, but I will admit that the picture does look somewhat better in this Superbit release and the DTS and 5.1 audio mixes are a tad more defined. If you just want the movie, then this is the way to go. Recommended.